Vina OrenMode is new premium eCommerce Joomla Template with modern and responsive design optimized for desktops, tablets and smartphones. This template the perfect combination of beautiful design with one of the best eCommerce solutions for Joomla 3, the VirtueMart 3 component. This template is suitable for every type of stores: fashion shop, watch shop, bag shop with many features. 3 Home Page Layout: Vina OrenMode comes with 3 beautiful home page for online shop, that’s easily fits for any kind online shop. Fully Support VirtueMart 3: Built with the experience of more than 10 years VirtueMart 3 provides you with a powerful and comprehensive eCommerce solution. Vina OrenMode is Fully Support it! Multi-Languages: Vina OrenMode is also fully support multi-languages. We had already installed 5 languages: English, French, Hebrew, Russian and German. You also can use one default language to build your website with no time. Virtuemart Product Compare: Brilliant Joomla Component and plugin to show Compare products which user/Customer will choose by click on “Add to Compare” button and these selected product has been show parallel. User can also delete Compare product from Add to Compare Cart. Vina OrenMode is fully support this component. VirtueMart Product Wishlist: The Ultimate Component to save your Favorite Products/Wishlist, share them with Family and Friends over Twitter, Facebook, Google+ or Email. Vina OrenMode is fully support this component. VirtueMart One Page Checkout: Make it super fast for customers to purchase with your store. Create special pages where customers can choose products, checkout & pay all on the one page! Vina OrenMode is fully support this component. Newsletter Function: AcyMailing is a Joomla component allowing you to maintain real communication with your contacts via e-mail marketing, newsletters, follow-up autoresponders, marketing campaigns, etc. Now Vina OrenMode is fully support it. Akeeba Backup: The best component can be used to backup, restore and move your Joomla! Vina OrenMode is fully support this component. It save your time to move development website to live site. 7 Premium Extensions from VinaGecko: Vina Camera Image Slider, Vina Article Carousel, Vina Vertical News Ticker, Vina Product Carousel for VirtueMart, Vina Product Ticker for VirtueMart, Vina Insta Grid Image Gallery and Vina Manufacturers Carousel for Virtuemart. 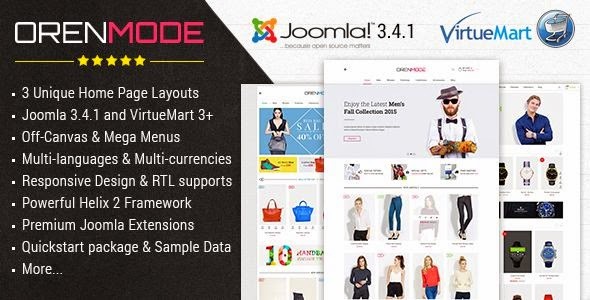 are the popular extensions for Joomla 3.x. Now you can use it in Vina OrenMode template. Fully Support JComment component: JComments is a powerful and easy to use AJAX based comment system for Joomla. Vina OrenMode is Fully Support it! Item Reviewed: Best Responsive eCommerce Joomla Template 2015 9 out of 10 based on 10 ratings. 9 user reviews.